blockbuster originally referred to a large bomb that would destroy an entire city block during World War II; now in common usage, an impactful movie that is a huge financial success - usually with box-office of more than $200 million (the new benchmark by the early 2000s, after the original mark was $100 million) upon release in North America; ticket lines for blockbusters literally go around the 'block'; also known as box-office hit; the term may also refer to a costly film that must be exceptionally popular in order to recoup its expenses and make a profit; the opposite of a blockbuster is a bomb, flop, or turkey. See All-Time Box-Office Bombs/Flops. 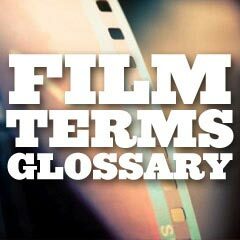 Examples: The term was first applied to Steven Spielberg's Jaws (1975), often acknowledged as the first blockbuster; James Cameron's Titanic (1997) was also a massive blockbuster hit. See All-Time Top 100 Box-Office Hits. Examples: E.T. : The Extra-Terrestrial (1982), Altered States (1980), and the Star Wars trilogy were shot in 35mm and blown-up to 70mm; films originally shot in 70mm include Ben-Hur (1959), Lawrence of Arabia (1962), My Fair Lady (1964), etc. ; in film itself, the development and blowing-up of photographic images to reveal a murder in Antonioni's Blow-Up (1966). Example: Marli Renfro, a hired double for Janet Leigh for test scenes in the shower scene in Psycho (1960). Bollywood refers to the burgeoning film industry of India, the world's biggest film industry, centered in Bombay (now Mumbai); the etymology of the word: from Bo(mbay) + (Ho)llywood; unlike Hollywood, however, Bollywood is a non-existent place. Example: Mira Nair's Monsoon Wedding (2001), a modern Indian film set in current-day New Delhi, echoes the Bollywood spirit with typical traits including music and dance, romance, and comedy. Also the Best Picture winning Slumdog Millionaire (2008). boom shot a continuous single shot made from a moving boom, assembled like a montage, and incorporating any number of camera levels and angles. Example: Hitchcock used this filming technique for almost all of Rope (1948). bootleg an illegally copied, unauthorized, and/or distributed version of a copyrighted film/video/DVD, often of second-rate quality; also termed pirated. Example: a bootlegged DVD version of Star Wars (1977), mastered using an Asian release of the special edition laserdisc. box-office the measure of the total amount of money or box-office receipts paid by movie-goers to view a movie; also referred to as B. O. or gross; usually divided into domestic grosses (unadjusted and adjusted for inflation), and worldwide grosses; films with great box-office results or a strong and outstanding performance are often termed 'boff', 'boffo', 'boffola', 'whammo', 'hotsy', or 'socko'. bumper usually refers to the pre-film segment of pre-made film that contains studio trademark and logo or title identification; also refers to a period of positive financial growth (i.e., it was a 'bumper year' for films) Examples: MGM's lion, Universal's spinning globe, DreamWorks' cloudy scene with boy fishing, etc.